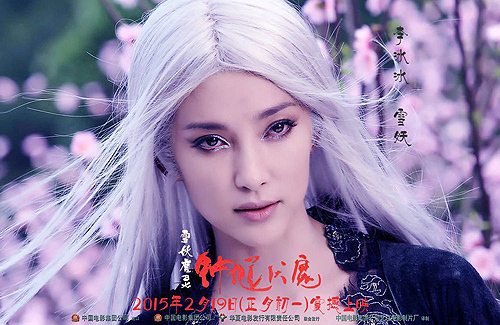 The upcoming movie, Zhong Kui: Snow Girl and the Dark Crystal <鍾馗伏魔：雪妖魔靈>, stars Chen Kun (陳坤) as the titular mythological figure who drives out demons, and Li Bingbing (李冰冰) as a captivating snow demon. Zhong Kui focuses on the relationship between the three worlds of immortals, demons, and humans. After wrapping up filming last month, the movie unveiled two new concept posters at the recent Shanghai International Film Festival. Designed to look like a pair of eyes from far away, the posters depict hero Zhong Kui, standing alone in a blackened world, and Bingbing’s snow demon, solitary in the white demon world. In order to achieve his character’s bearded look, Chen Kun had to spend four hours a day in the makeup chair. For scenes that called for the addition of more special effects, the time could even be doubled. However, Chen Kun was happy to make the sacrifice because of his newfound interest in mythological films. “If you’re working on a mythological film, come find me,” he said at the press conference of Zhong Kui. Now that Chen Kun is an A-list actor, he wishes to learn a little more about filmmaking, which is why he signed on not only as the lead actor, but as one of Zhong Kui’s investors as well. Nevertheless, he shared that his main responsibility, apart from acting, was simply to check the film’s investment reports and make sure the crew was not going into debt. Despite this, he admitted that the pressure was very heavy at times, and he even lost almost five pounds over the course of three months. Directed by Zhao Tianyu (趙天宇) and produced by Ann An (安曉芬), Zhong Kui is backed by investors from mainland China, Australia, and the United States. Well-known special effects company Weta Workshop, which worked on the Lord of the Rings trilogy, also had a hand in the character and setting design. Zhong Kui is slated for a February 19, 2015 release. I say…if you boycott Malaysian products and went on a verbal rampage about another country, hey guess what? I am going to boycott all your movies too, Chen Kun! Public fugues need to put extra care and attention to what they say and do, that’s the price you pay and the game you subjected yourself to in the first place. After the claim of him boycotting malaysian products, I unfollowed him, and many other chinese stars who made themselves look like fools because of what they say. who need you and what price the stars paying lol ? I think atm their bank account probably have over 2 million dollar . Also i don’t think malaysian fans or that country mean anything to china …. you already had biases and prejudices toward chinese stars before the airplane disappearance. Frankly speaking, who care about Malaysia’s market anyway? I only hope they going to show it the same time with China. Wow…you are speaking as though you know me personally. Please think before you speak. Thanks. I like the theme of this movie a lot. 3D and moreover LOTR team. One of the better choice for chinese new year schedule. The male poster is great, the female one is ugly, uninteresting and she looks more like one of those Japanese ghost chick. Meh, I don’t like Chen kun that much, so possibly pass/ignore this film. And the concept of this film is boring :/ also, snow demon? Isn’t most demon are a creature base? There is/has never been a snow demon. They just pick snow to do “pretty effect” *eyebrowns raised* and this is heading toward snow queen smash up Chinese demons/fairy story? 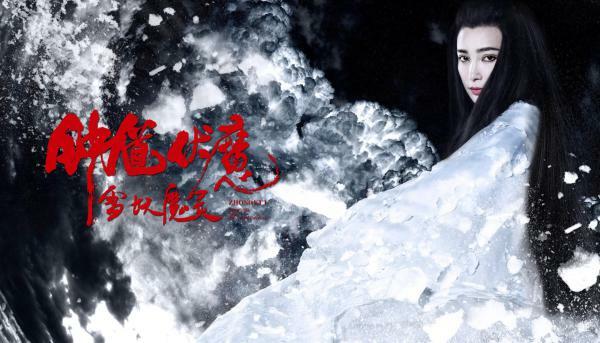 Snow demon is very common in chinese folk tales. Not all demon are creature based. They can emerged from trees, snow, pei pa, etc. 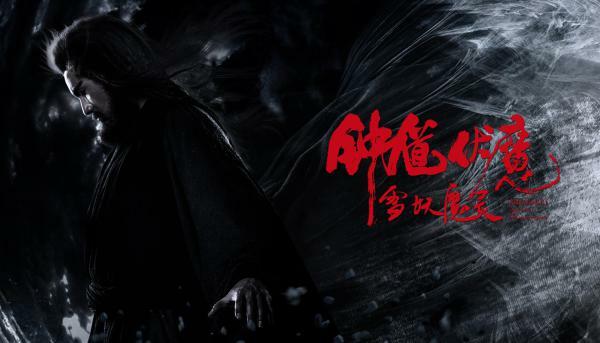 This is a grand production and many who saw the preview said the effect are magnificent. I will certainly not going to miss this. Zhong Kui is the chinese god whose picture we placed on doors to chase away ghost. alfi, jenny, sugardaddy- First off, you guys didn’t have to make comments on my comment. You didn’t even need to read it. LOL. Clearly, you guys are ignorant about the different types of things that are manufactured or put together in Malaysia. And you didn’t really have to put any country/people down. I am only speaking the truth, artists need to be more cognizant of what they say and their conduct as public figures. If you can’t handle the truth, then pls move on to another commentor. Thank you. Did I say anything abt Malaysia’s products? I only pointed out that Malaysia market is too small that the Chinese don’t really care if you watch the movie or not.Don’t sulk if people don’t agree with you. I know very well what Malaysia exports. Jenny, i apologize for misconstruing your words, but there is a nicer way to present your ideas across than how you did it. “Who cares about Malaysian market anyway?” is honestly quite rude. My original point here was a subjective one, and I wasn’t really asking for approval from anyone here. I am only speaking the truth, artists need to be more cognizant of what they say and their conduct as public figures. And just for your records, I am NOT from Malaysia.I was born and raised, and have lived in the U.S. all my life. You should follow your own good advice about not putting any country/people down. From all your previous comments, you never fail to put China and Chinese down.